Southernside Apartments features wonderful amenities both inside the apartments and as part of the community. Spanning 15 acres in St. Charles County and just minutes from St. Louis you'll not only have everything you need on site in our garden style apartments and community center but also be just a quick drive away from some of the best the area has to offer. 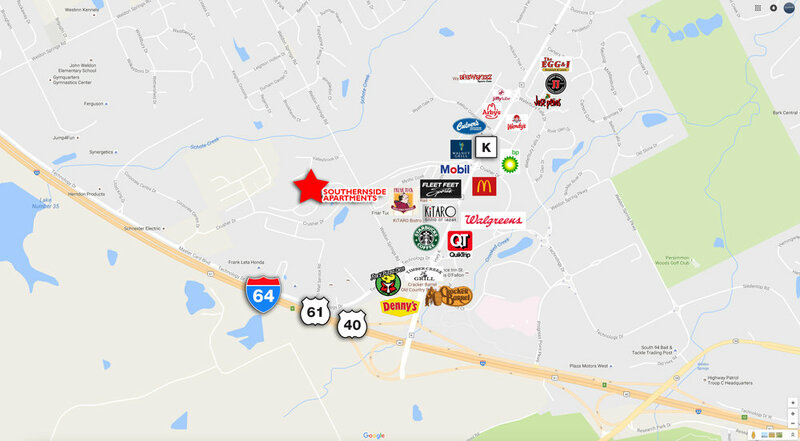 Near a nice business area and close to interstate 64 you'll be able to get what you need and get where you're going with ease. We allow 1 (ONE) pet per apartment. All males must be neutered and females must be spayed. Vaccination records must be provided. Southernside Apartments for rent in O'Fallon, Missouri is a new construction community that is now leasing fast. Located just minutes from St. Louis! The community, spanning 15 acres in St. Charles County, features one, two, and three bedroom garden style apartments. Interiors include a microwave, electric range, refrigerator, dishwasher, disposal, central air conditioning, 9 foot ceilings, patios or balconies and washer/dryer hook ups. Covered parking is available. The community features a 3,075 sq.ft. clubhouse which includes a fitness center, great room, game room, laundry facility, business center, locker rooms and an in ground swimming pool with adjacent children’s pool! Southernside Apartments is a tax credit community with income limitations as follows: 1 person $30,000; 2 person $34,320; 3 person $38,580; 4 person $42,840. Thanks for your interest in our community!